A bit of sappiness on 1,000,000 views! Dear Friends, I hope you have had a good week. This week has been an exciting week at Ivory Spring in that we passed the 1,000,000 mark in page views on this blog! I want to thank you all for your visits and comments, and more importantly, your encouragement over the years! I have enjoyed meeting all of you, and having you as friends! So many of you have become fixtures in my life. I start worrying about you if I don’t hear from you for a few days. Many of you write me in the middle of the night just to share a word of encouragement – words cannot express how much I appreciate those middle of the night emails when I am up alone working away. Many of you write to share prayer requests – I feel honored that you entrust me with your prayer requests. Many of you just write and share with me your life story – I love reading your stories! Many of you send pictures of your work – you know I just absolutely love to see what you are working on. So many things have happened since I started my blog. I became a mother, and on top of that, I became a full-fledged quilt designer. Many of you have been so dear and sweet toward me almost from the very beginning, and have seen my life morph into a chaotically busy mess. My “bloggy” inner circle continues to expand as I got to know more and more of you. I want to thank all of you for being a part of my life! I count you as God’s blessings in my life! Again, THANK YOU! #1 To celebrate Ivory Spring’s 1,000,000, Annie’s agreed to offer a free class for my Learn to Machine Quilt class as a giveaway prize! So, if you haven’t signed up for my class, and are still thinking about it — here is your chance to maybe win a free class. If you are not familiar with the class, click here and here to find out more. Comments are accepted between now and 4/5/2013. To be entered in the giveaway: Please share about what online quilting classes you would like Annie’s to offer in the future. #2. Now, if you have already signed up for my class, you have a chance to win a Throw Size (60″ x 60″) Hobbs Tuscany Silk Batting! If you have followed me for a while, you know I almost exclusively quilt with Hobbs Tuscany Silk Batting for all my magazine projects. Comments are accepted between now and 4/5/2013. To be entered in the giveaway: Please share about what you think of my online Learn to Machine Quilt class. Thank you, Dear Friends! I wish you a lovely weekend. I will come by on Monday with another 1,000,000 giveaway. Stay tuned. This entry was posted in Quilting and tagged Giveaway, Hobbs Tuscany Silk Batting, Learn to Machine Quilt class, Wendy Sheppard. Bookmark the permalink. Hi Wendy! Thank you for being there & such an inspiration to all of us. I’ve taken several online free motion quilting classes, finishing up one now, but I sure don’t care for that teacher’s style. I keep coming back to your quilting motifs. i’ve using Silk batting for the last few table runners I’ve done & just love working with it. It is so light weight & easy to manuever. So enter me in your give away please;). Congratulations on 1,000,000 views! I have enjoyed getting to know you through your blog and seeing your lovely work. I ditto the congratulations! What a landmark! Is this class suitable for a DSM or is it for longarmers? I would love to try (learn) this. All I have “quilted” is a little candle mat. Yes, call me chicken! This class is for domestic machine quilters. I quilt ALL my quilts on my domestic machine. Hope this helps. Wendy, congratulations on the million milestone! Your work is incredible and inspiring. Even better, you seem like such a lovely person! As far as further Annie’s classes, what would be better than an advanced Wendy Sheppard quilting class? Congratulations! I am so inspired by your beautiful quilting. I would need a beginner’s course. Thank you for your generous giveaway. Just love your Blog! Congrats on the milestone! Class suggestion….handling large quilts in the home machine, tips and tricks, math behind the squares, more on the modern quilting. Thanks for the opportunity! What a generous way to celebrate! I didn’t know about your classes until today. I’ve taken a local class and have been practicing but still don’t have the hang of it—lack of control, consistency of stitches, etc. Lots to learn! Would love to win the prize, but either way, I’m excited to find your beautiful work. Thank you for all the tips, tutorials, free-patterns, inspiration and heartwarming insights you share with us through your blog. I’d like to see more free-motion quilting classes at Annie’s, including a 2nd (and 3rd) class with Wendy Sheppard!!!! Gosh, your FMQ is so spectacular. Congratulations on your milestone. I have been considering your online class. I love your feathers, and have been trying to incorporate them into some recent quilts with limited success. Would love to win this class. Congratulations on the milestone. Love the inspiration you give to us Whether it be pictures of quilts, tutorials, tips, etc., they are all wonderful. Thank you!!! And what a great giveaway. One can never learn enough. Congratulations! I love your blog and always enjoy seeing what you are working on. You do such beautiful work. Please enter me in your giveaway! What a wonderful gift. Wendy, I am soooooo happy for all your success!! Your being such great Mom, quilt designer, blogger, machine quilter, teacher and friend. Funny how I too sometimes check e-mail at night! I would love to win your class and I also would like to see an advanced free motion class from you. Congratulations on your milestone. I love your blog…….always refreshing and inspirational. I enjoyed participating in your online class. I like that I can go back and watch, “one more time.” Another class of Wendy’s tips and tricks, along with more quilting would be sensational. Wendy, you deserve your success! I get notified by email of your updates and enjoy every one. Your clean line, do-able quilts, colors and quilting are in inspiration. Congratulations. You are a gifted person and an inspiration. Thanks for all you do to encourage us and bless us. I always love hearing about Miss Baby too. You amaze me with your productivity. I wish you many more blessed years doing all the things you love. You are so gifted and I love to get your emails. I would love to see Annie’s offer more of your FMQ videos, such as just feathers, and also instructions on how you design. Thanks so much for all your do and God Bless you. Hi Annie, Congradulations! I just love your blog and have been following you for quit a while. Actually your wonderful FMQ videos and photos are the reason why I even decided to give quilting a try as your instruction helped me to believe in myself that I could actually do FMQ. Congratulations on your wonderful milestone and all the fabulous work that you do. Classes on design ideas would be go – different ways of looking at blocks /quilts and techniques for deciding what to put where! Great giveaway!! A Happy and Blessed Easter to you and your family! And congratulations on a million views! That’s an accomplishment! And thanks for another view of some of your previous work. The Coxcomb & Berries quilt is my very favorite. I love a good applique and the button berries are just too cute. 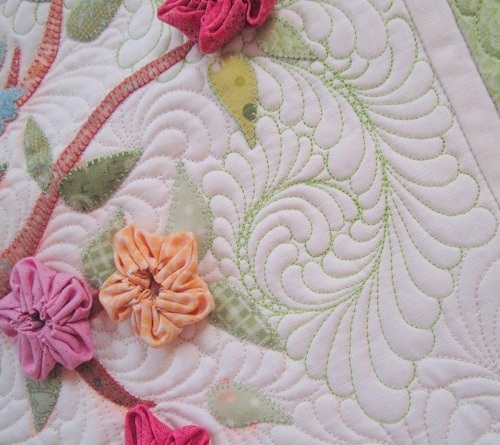 But the quilting on the spring flowers quilt is outstanding. Just the ease and the swoop of the feathers with those little pearls dotting the spines…Swoon! (that’s the word I learned from reading quilting blogs! I never used it in my life before.) You are truly a fortunate and blessed woman. Your feathers are beautiful. I’d like to see a lesson on planning a quilting design. Congratulations! 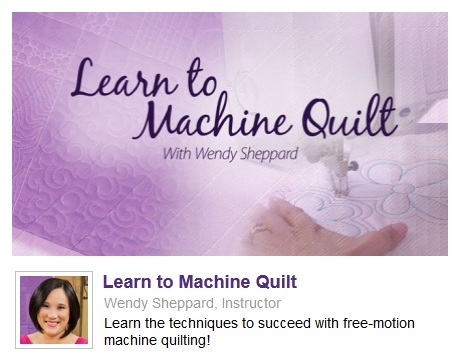 I would love to be able to watch your machine quilting video. You have given me a lot of inspiration in your blog. I’d love to see how to plan and mark your design on your quilt top. It is always a mystery to me how I am going to end up. I definitely need help in this area. thank you for the chance to win. Wow, congratulations on your 1 million views, that is amazing, but not surprising! I refer to your “Thread Talk” posts frequently, and I feel like they have really helped improve my FMQing. I would love to stand behind you and look over your shoulder while you are quilting, but since that isn’t likely, I would love to win a spot in your class. I’m not sure what classes are offered, but I am always interested in new techniques and tips for better accuracy in cutting and piecing. I would also be interested in a class that would help me visualize what my finished quilts will look like…if that is possible… Again, congratulations!! Congratulations Wendy! I love visiting your blog, you give ME inspiration! Wendy, congratulations! I am so very happy for you and admire your work. Your blog is truly an inspiration for all of us. I would like to see more online classes about quilting on applique quilts and also on design. Happy 1,000,000! I’m not sure I’ve ever commented before but I’m a very faithful reader. I’d love to see precision piecing classes. Something that is completely focused on accurate blocks. I love seeing your quilts, but am guilty of not saying “thank you” enough! I have been inspired by your work to try new combinations and patterns. Thanks for sharing all you do. You really are an inspiration! That is an amazing milestone. Congratulations….well deserved! I would love to see a class on batting and threads. You’ve changed my quilting over this last year. I was always a hand quilter, and now I can’t wait to find a way to sneak in some feathers using free motion. Your gentle encouragement made the difference, and I want to thank you. Wendy it has been such a blessing to get to know you over these last few years. You are such a gifted quilter, and you share your love of quilting with all of us. Congratulations on hitting such an amazing milestone! I don’t know what all classes are already offered, but color theory is something I lack majorly. 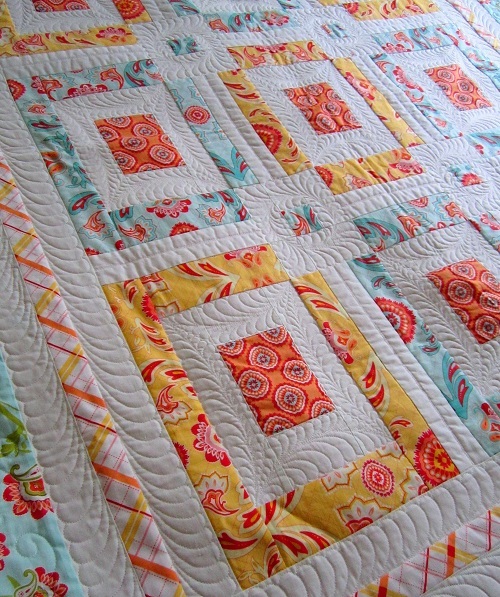 I’d enjoy a class on quilting filler designs! Wow! What an awesome milestone….1,000,000 views! Congratulations!! 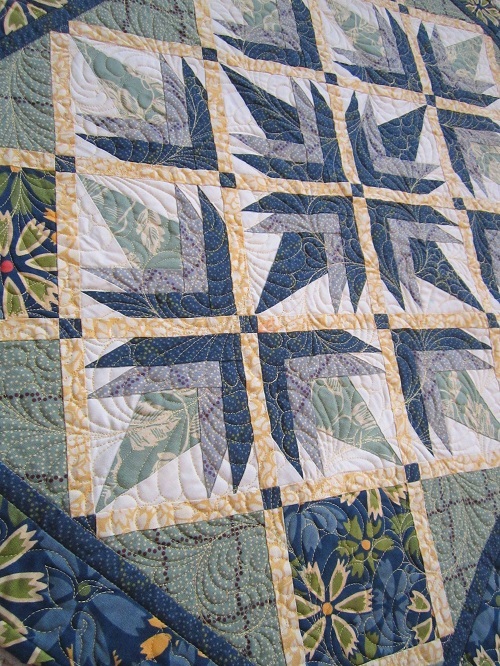 The quilts in the pics today are soooo very gorgeous that I can hardly take my eyes off of them. Are they your designs? Is there a place we can see the entire quilts? I would never have imagined that you quilt all of your quilts on a domestic machine which I just read in an answer you gave to a comment. I am a relatively new follower but I’ll be hanging around because I love what I see. Hi Wendy, You are incredible. Your quilting is exquisite! I am glad I am counted among the 1,000,000. Every time you respond, it feels like I am one of one. :) and it’s amazing you respond to all my comments. Thank you. I would love to win the free motion quilting class with you. I would like Craftsy to offer an online class with beading and quilting. Ways to use beads in quilts. I just love the sparklies and would love a class that could give me ideas of ways to use them in quilt projects. Congratulations! It’s no surprise that you have made it this far! I would love to take your online class – I’m sure I will become a much better quilter for it! WOW! Congratulations! You do beautiful work, guess practice DOES make perfect. , your work certainly is. How long have you been quilting? and . 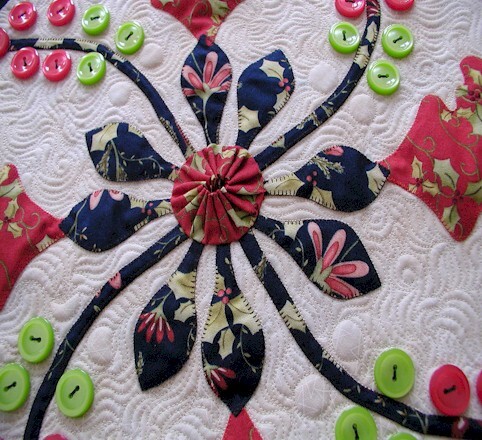 . .
How did you attach all those buttons on the quilt???? Congratulations dear Wendy! You are such a blessing and inspiration in my life. I so appreciate the fact that you share with all of us so freely. And the sneak peaks of all the fabrics lines is so much fun! I already signed up for your online class. It’s wonderful to watch you and “feel” as if your talking to me. It would be nice to see you continue with a new class. I also feel that Annie’s could add a class showing how to manage a large maybe even king-sized quilt in a domestic machine. Finally, I haven’t forgotten that I owe you a picture of my handsome grandson Dylan, and his quilt! And yes, I made it from start to finish! lol! Congrats Wendy. I have not had a class with you but I love your work. Looks like I might have to sign up soon. I want to learn to FMQ but have not tried it yet. I am practicing on some squares. Would love to learn more few. Congratulations on your milestone. Thanks for the chance to win. I would love to see a class on how to select a quilt pattern to compliment the quilt. You get back what you give, Wendy, and I’m hard-pressed to think of anyone who gives more encouragement and inspiration to others as you! Wendy, you are amazing, but I think I tell you that every time I come on here. But you are. Truly. And those quilts… GORGEOUS. A reflection of you, my dear. Congrats on this much-deserved milestone. You are so talented and sweet and deserve only the best. Love to you, Miss Baby, and your sweetie. May you have a very Happy Easter. Well it’s certainly not hard to believe you are so popular! I thank you for your generous teaching on your blog. It certainly is a go-to source for me to learn free motion. I look forward to being able to take your class. Maybe I’ll finally figure out that Jester’s hat sewing route. I can’t seem to get that coordinated! But I have been improving my feathers which like everyone, is my favorite. I come to your Thread Talk alot. Thank you again & Happy Easter! Wendy, Congratulations on the 1,000,000 views. I started following your blog last year when you were introduced by Sew Cal Gal in the 2012 Machine Quilting Challenge. I enjoy seeing what you are up to and the tutorials too. For Annie’s, I would love any training on free motion quilting on the domestic machine. Congratulations and I love what you are working on. I’d love to win a spot on the free class. Thanks! Hi Wendy, I have only known since Christmas 2012 when on my suggestion, my husband gave me your online quilting class for Christmas. I have enjoyed it very much. I have some delays in finishing the class. The first was because I had to wait until I could afford the fabric. The second was because in 1976 I bought the top of the line PFAFF. It is a beautiful machine and I still use it, but after looking through my manual, calling PFAFF dealers, and trying to figure it out myself — I have realized my dear old friend of 37 years was not able to free-hand motion or drop its feed dogs. Luckily, I had bought a small Husquvarna machine a couple of summers ago to do some out-of-town classes because it was much lighter than my PFAFF to carry. So then I had to wait until I could afford the free-hand motion foot for the Husquvarna. I just purchased that foot this last week, so I will probably continue my online class, early this coming week. The class has been easy to understand, and Wendy you are so gentle and patient. It is wonderful, the class is lifetime, and that I can go back over and over again. The handouts are very well done and helpful as well. And yet, I am so grateful that I can ask a question of you, and you respond so quickly. I have never been delayed because of a question I have. And you always have well-wishes for me at the end of each response. Because of your encouragement, I have started blog: “If I Can Quilt, You Can Quilt Too”, which I enjoy as well. Have a happy Easter. I hope your little Miss enjoys it. I am sure she will. I asked four year old grandson, who will be five years old on the 6th of April if he knew what was special about Easter. I was so happy and pleased when he told me it was because Jesus died for us. His mom and our church have taught him well. When I noticed that you have been asked to pray for others, I was wondering if you pray for me and my husband. We need our finances to turn around so that we can afford our early retirement years. We both have had to retire early, and we are very broke. I hope you will have a happy Easter and a quiet Easter; and hope you will take a few days off to enjoy this special holiday. You are a wonderful teacher, but you need a break as much as any of us. Thank you for your wonderful lessons. Congratulations on one-million page views. Wow! Your FMQ is such an inspiration to me and I would love to be able to take your online class at Annie’s. Your style and scale of quilting is in line with what I am trying to accomplish, but I’m stuck on whether I need a stitch regulator to achieve such even stitches so I’d love to see your quilting in motion! Thanks for being so generous in sharing your quilting with the online world. Congrats on your blog’s success. It must feel great to have created such a large virtual network. I would love to win your online class. I have taken machine quilting classes in person in the past. But unless I practice it right after, I loose the “muscle memory” that machine quilting draws upon. In your future classes could you discuss how to decide which patterns you use and where. Fabulous that you have been able to influence so many quilters! I first heard of you via SewCalGal’s project last year, then my friend mentioned your lessons as she is just getting started with quilting and of all the links I sent her, your lessons really appealed to her! I would really like to get the Hobbs Tuscany Silk Batting – just know it would be a great product to use in my projects! I’ve never tried anything by 80/ 20 PolyCotton. I would love to try this and see the difference. You are very generous with teaching on the blog. I would be thrilled to have an on-line class with you. I have some of the silk batting, yet to be used. I would love to take your class and hope to do it in the future. If I could machine quilt a tenth like you do, I would be thrilled. Your quilting is so beautiful, I just love it..
Congratulations Wendy on 1,000,0000 views. It’s no surprise. Your work is out of this world. Thank you for all the inspiration. Would love to see an advanced class from you which would incorporate your Thread Talk. I dream of being able to quilt freehand feathers like you. Also, would love a class that shows you actually quilting an real full size quilt-handling and moving it in the home machine. Maybe showing it step by step and in different views. That would be so helpful and totally different from quilting a 20 inch square or so which are great for practicing and learning the basics but not the same as full size quilts. Thanks again Wendy. Hello, first time to your blog. I just recently straight stitched quilted a mug rug and would like to learn more about machine quilting (first I need to get the proper feet for my machine) Your class could definitely teach me a lot. What a great give away! Thanks for the opportunity. I think the thing I’d like help with is planning the quilting pattern. How do you pick what to quilt, how to combine patterns, and what Beth said a couple of comments up.